Circles Of Confusion is the third film in a trilogy titled Acts Of Light (1972-74). These works explore human color perception, the system of color production in the photographic emulsion, the physical qualities of the emulsion and base, the laboratory methods of producing and reproducing prints, and the ordering system of successive individual frames that create the illusion of motion and the passage of time. 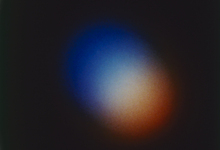 In this film, circles of colored light (red, green, blue) pulsate and flicker as they move around the frame. Where they intersect, they display a variety of secondary colors. The term, circles of confusion belongs to the physics of the lenses. Here it refers to the focus of mental and emotional energies as an irrational system for composing a film.